In a new contract, a longtime provider of meals for the District's homeless is getting a sizable reduction in funding — and it blames "a broken system for shelter nutrition." 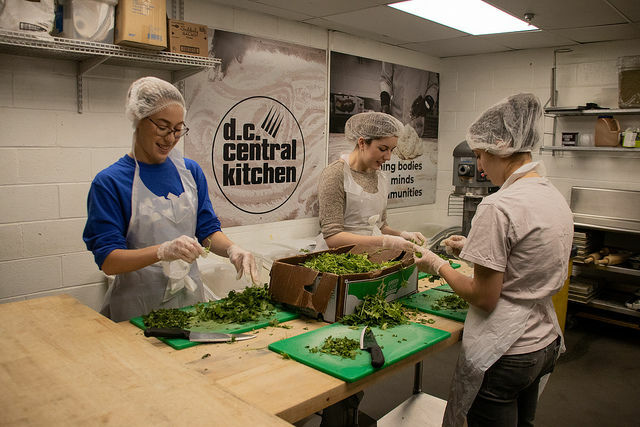 It’s a nonprofit that has fed the homeless since 1989, but now a new contract with the District has dealt a blow to D.C. Central Kitchen. As the vendor looks to operate with a $1 million revenue shortfall, it is raising questions about the District’s contract process. “We were stunned to find out that the majority of the meals that we had previously been providing for almost 30 years had been awarded to another vendor,” said Alexander Moore, the nonprofit’s chief development officer. Last year, the kitchen was told it must rebid for the job of providing more than 2,200 meals a day at homeless shelters around the capital, Moore said. The bid process was handled by The Community Partnership for the Prevention of Homelessness, which is hired by the District to oversee some of the needs of D.C.’s homeless population. Once the bidding process was complete, the kitchen discovered that its new contract would be much smaller — covering only five small shelters for a total of 800 meals a day, with a majority of its business going to another vendor. The new contract details were first reported by the Washington City Paper. The organization at first believed the move was a result of a new vendor, Henry’s Soul Café, offering a better per-meal price, Moore said. But they learned the new vendor would be collecting a higher per-meal rate than D.C. Central Kitchen. According to Moore, the for-profit restaurant would receive $5.18 for a lunch or dinner, while D.C. Central Kitchen placed a bid offering a price of $3.50. Moore said that his organization was not offered more information on why a majority of their workload went to the new vendor, and that it raises serious questions about the bidding process. “We really want to shine a light on what is fundamentally a broken system for shelter nutrition in the District of Columbia,” Moore said. WTOP has reached out to both the partnership and Henry’s Soul Café for comment. In a statement, Dora Taylor-Lowe, D.C. Human Services Department spokeswoman, said the bidding process is an open and competitive process that provides transparency through a review process offered to those bidding. “Vendors for each shelter site were selected based on knowledge of food safety best practices, demonstrated experience with quality-control protocols and meal preparation in large quantities, and other solicitation criteria, such as past performance,” Taylor-Lowe stated. The department would not go into the details of the contracts.